'We Didn't Lie,' Volkswagen CEO Says Of Emissions Scandal : The Two-Way Speaking with NPR, Matthias Mueller blamed the problem on a misunderstanding of U.S. law and said the company doesn't have an ethics problem. Less than a day later, he asked to clarify those remarks. Volkswagen CEO Matthias Mueller speaks to the media Sunday in Detroit, apologizing for the scandal that has plunged the German auto giant into crisis. The North American International Auto Show is a place where car industry gathers to celebrate — and in recent years to apologize. 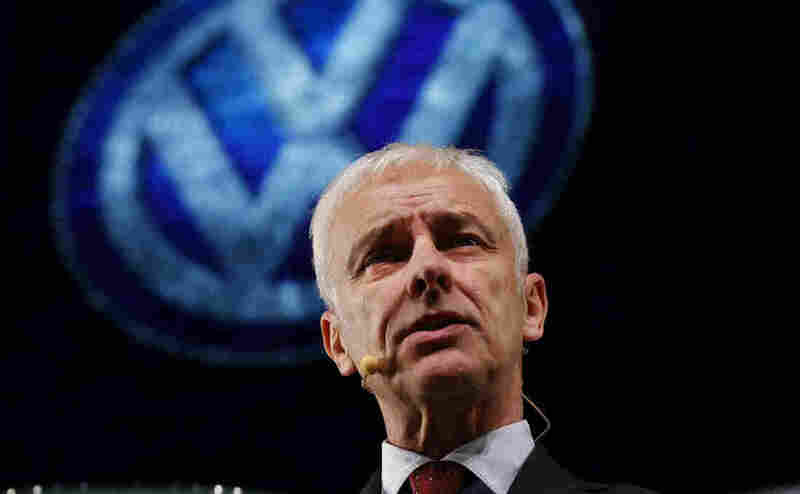 At this year's show in Detroit, it was Volkswagen CEO Matthias Mueller's turn to face the media. In a prepared statement, Mueller said of the emissions-cheat scandal, "We all know that we have let down customers, authorities, regulators and the general public here in America, too." He added, "We are — I am — truly sorry for that. And I would like to apologize once again for what went wrong with Volkswagen." Following his remarks, Mueller spoke briefly with NPR. He said Volkswagen did not lie to U.S. regulators about emissions problems with its diesel engines but chalked it up to a misunderstanding of U.S. law. Mueller: We don't want to change the American thinking. We have to make up our mind and we have to change our thinking. And we just do that. NPR: How do we know when it's changed? How will we know when Volkswagen is different? Mueller: I'm CEO in three months, and I'm working day and night to make a change process within Volkswagen. We started this, and it needs some time. It needs, let me say, one year ... one to three years. For example, we have installed new board member for integrity and — Ms. [Christine] Hohmann-Dennhardt, she came from Daimler with a lot of another solutions within our company. NPR: There were a lot of people in Congress and the [Obama] administration who are very angry with Volkswagen. What do you say to those people who are investigating and who feel like personally that the company lied to them? Mueller: First of all, I have to apologize on behalf of Volkswagen. Second, I have to promise — and we will do the pledge — that we deliver appropriate solutions for our customers. As soon as possible. NPR: How soon is soon? Mueller: We have to discuss it with the EPA on Wednesday, and then we will see whether the time schedule is OK or not. On Wednesday, Mueller is expected to present the Environmental Protection Agency with Volkswagen's plan to fix the emissions problem. After a portion of this interview with Mueller aired Monday on Morning Edition, Volkswagen approached NPR, asking for a do-over of sorts, another conversation with the CEO. So we spoke with Mueller again. Here's a portion of the follow-up conversation. NPR: When we talked yesterday, the key line seemed to be that this was a technical error. Which sounds to us in English, like, "Oops." When it wasn't an oops. It was more than a technical error. It seemed to be intentional. NPR: It's not a hill to climb; you've got a mountain range and then another mountain range and then another mountain range. How are you going to do that? Mueller: We're doing our utmost. We have worked night and day to find solutions. Not only technical solutions. It's a lot of work for the lawyers and also for the press department.